Mulan Enchanted Tales: Honesty. 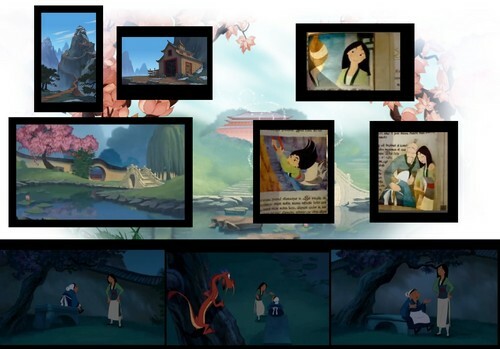 Little summary what I found the never made Mulan's enchanted tale. Few backgrounds, scenes from trailer and few pictures from Disney Princess Enchanted Tales: Follow Your Dreams DVD.. HD Wallpaper and background images in the Disney Princess Mulan club tagged: disney princess mulan family. Little summary what I found the never made Mulan's enchanted tale. Few backgrounds, scenes from trailer and few pictures from Disney Princess Enchanted Tales: Follow Your Dreams DVD. This Disney Princess Mulan photo contains anime, grappig boek, manga, cartoon, and stripboek. It's too bad it never got released! Maybe sometime soon I hope! Yeah, it's looks like it would have been more about Mulan's family and I for sure like to see it. Even if it was bad they couldn't make it worse than Mulan ll was.